Wayne Harper Ambler was an American professional baseball player whose career spanned six season, including three in Major League Baseball with the Philadelphia Athletics. Over his career in the majors, Ambler player second base and shortstop. He also played in the minor leagues, Ambler played for the Class-A Williamsport Grays, the Double-A Jersey City Giants and the Double-A Indianapolis Indians. 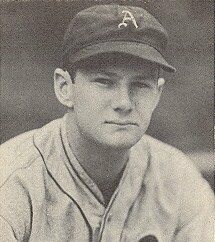 Ambler made his major league debut on June 4, 1937, after never playing in the minors, a rare feat. During his major league career, Ambler compiled a batting average of .224 with 175 hits, 39 doubles, two triples, 73 runs batted in and four stolen bases in 271 games played. Ambler was discovered in 1933 by an amateur baseball umpire who introduced him to Connie Mack, the manager of the Philadelphia Athletics at the time. Mack later introduced him to his friend and manager of the Duke Blue Devils baseball team, Jack Coombs, who persuaded Ambler to play baseball at Duke University. While attending Duke, Ambler's tuition was paid for by Mack. He graduated from that institution in 1937 with a Bachelor's Degree in business administration.